Making your desk look professional is key to be a good boss or employee, especially if you are often in contact with customers in person. Having a beautiful wooden business card holder will give your clients a sense of professionalism and seriousness about how you care for your customers. This small wooden business card holder is a beautiful dark cherry or red mahogany. This will look absolutely professional and high class sitting on your desk. The little block holder measures at about 3"W x 2.75"H and has a 3.5"W x 2"H name plate that sits in the slanted front. This front name plate is sublimated with your personalized design! The slot on top of the block will hold business card that are no wider than 3.5". 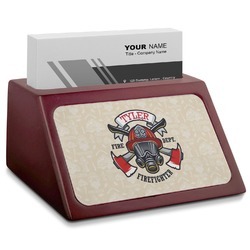 The slot is approximately 0.75" wide and can fit 30 traditionally sized business cards comfortably. To care for your business card holder simply dust with a damp rag. Go into our design center to get started customizing! Choose something professional or fun to spice up your desk area. Choose between thousands of backgrounds to start off. Change the ribbon, text, font, graphic, and more. You can even upload your own artwork or logo to look even more professional. Even take the artwork from your own business card! Do what you want the way you want! And if you need any kind of assistance, just give us a call. Decorate the rest of your office! Check out our Office and Desk Accessories section to find what you need. We have personalized mouse pads with wrist support, leatherette business card holders, keyboard wrist rests, tablet stands, and even cute sticky note cubes. 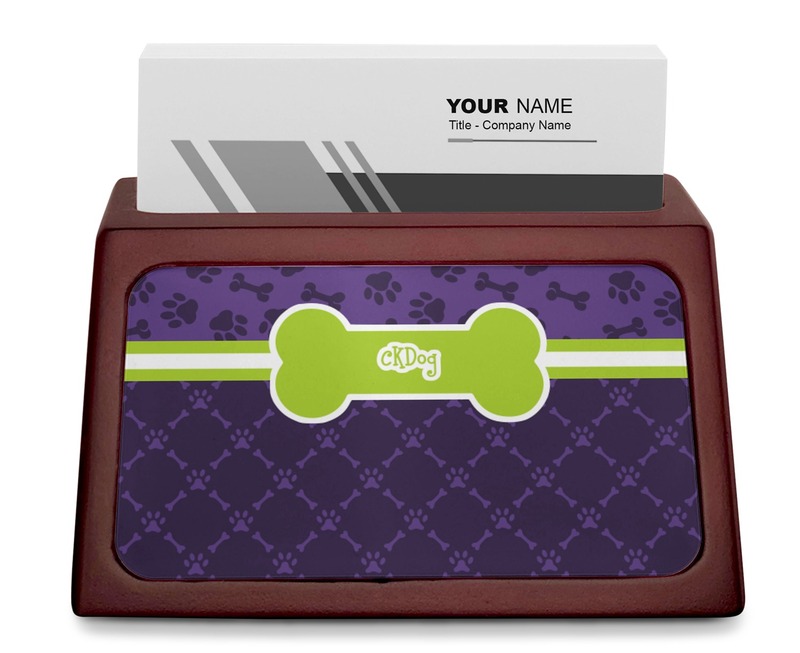 Get matching mahogony accessories like our sticky note holders and nameplates as well! 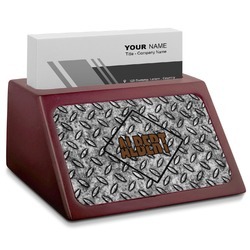 I purchased the business card holder for my office. Very nicely done! Completely professional! I've already been referring friends and coworkers. GREAT JOB! Received product in a timely manner and was exactly what I expected. Great colors and sturdy construction. Thank you!